Valencia Endanza celebrates its tenth edition in 2018. Throughout all these years, many students have trusted our international course and their commitment to us has translated not only into an unforgettable experience but also into a unique opportunity thanks to which they have been able to become professionals. 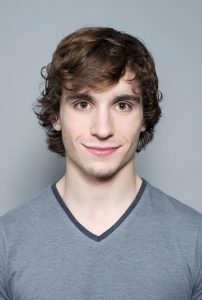 This is the case of Daniel Montero Real, a young Cantabrian dancer and current member of the Het Nationale Ballet, in Amsterdam. And in the classrooms of Valencia Endanza is where the great opportunity for Daniel Montero Real was born, that springboard that took him to the Netherlands, to Amsterdam, to the National Ballet Academy, where he finished his training and made his debut as a professional dancer. “I was one of the lucky people, I had my chance thanks to Christopher Powney, he took me apart during a class and I remember Pilar translating what he was saying because I didn’t know a word of English.” At the moment he said: Have you heard of the National Ballet Academy? “I said,” Yessssssssssssss!!!, . “From there, whatever he would said, I would do it, so he invited me to the school, his former school, the National Ballet Academy. A month after Valencia Endanza, I was there. ” Grateful for how his life changed after Valencia Endanza, Daniel Montero Real recommends our international course. “I would definitely tell you that you should go,” he concludes. Born in Santillana del Mar (Cantabria), Daniel Montero Real completed his training at the Real Conservatorio de Danza in Madrid and the National Ballet Academy in Amsterdam. Since his graduation, he is linked to the Het Nationale Ballet of Amsterdam, starting with his debuted in 2013 with their junior company. One year later, he acceded as apprentice to the main company and since 2015, he is a member of the Dance Corps of the Het Nationale Ballet of Amsterdam. As of 2016, Daniel is also the ambassador of Terre des Hommes, which is a non-governmental international solidarity organization that acts in favor of establishing conditions for sustainable, socially just and ecologically and economically viable development, both in the North and in the South, in particular through the defense of the rights of children and their application.